I’m usually not the biggest fans of military leadership books, primarily due to the excessive jingoism found in contemporary titles. However, I remember reading about this book somewhere and decided to dig in as I’ve always been fascinated by the Navy SEAL units of the special operations unit since I was a child, their rigorous training and discipline included. 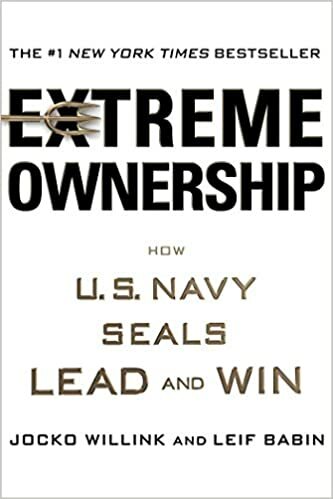 While I didn’t find the business stories/anecdotes particularly interesting, I had fun reading through some of the mission reports of the SEALs and their measured, tactical approach to getting a mission done. The book is organized into chapters that teach a specific lesson, and I’m going to organize my notes in the same way. – Extreme ownership: Leaders should be accountable far beyond their initial remits. If something outside of your chain of command is broken, it is still on you as the leader to own/fix it. – No Bad Teams, Only Bad Leaders: Example from BUD/S training’s extremely stressful rowing exercise where swapping out a winning team’s leader with a losing team’s leader led to the losing team winning. Author claims that the buck has to stop with the leader. – Believe: Important to believe in the mission from above and be fully invested in it. If you are not invested, you will never convey a convincing message down the ranks. If you are unclear about mission parameters, it is important to question up the chain of command until you fully understand and are 100% invested in the mission. – Check the Ego: Teams above individuals. Mission above everything else (yes, including people). – Cover and Move: Implies teamwork. Most fundamental tactic, perhaps the only tactic. All elements within the greater team are important to the mission and must work together to accomplish goals. Often when smaller teams get so focussed on what they are doing, they forget about others or how they depend on other teams. They may start to compete, and when there are obstacles, blame and animosity develops. Leaders to continually keep perspective on the strategic mission and remind the team that they are part of the greater team and the mission is paramount. – Simple: Keep things as simple as possible. Complex commands/instructions get further complicated once you deploy into the battlefield. Simple does not mean easy, and in fact the opposite. But it empowers decentralized decision making which is important. Also important that the frontline troops have the opportunity to ask questions about what’s important, in order to demystify the simplicity. * Evaluate the highest priority problem. * Lay out in simple, clear terms the highest priority effort for your team. * Develop and determine a solution, seek input from key leaders and from the team whenever possible. * Direct the execution of the solution, focussing resources on it. * Move to the next highest priority problem. Repeat. * When priorities change, pass information up and down the chain. * Don’t let one priority cause fixation. Maintain the ability to see other problems developing and rapidly shift as needed. – Decentralized command: Humans not typically able to manage more than 6-10 people. Imperative that frontline leaders can execute with confidence. * Continually check and question the plan against emerging information to ensure it still fits the situation. * Brief the plan to all participants and supporting assets. * Ask questions and engage in discussion and interaction with the team to make sure they fully understand. * Conduct post-op debrief after execution. * Analyze lessons learned and implement them in further planning. Leading up as important as leading down. Takes more skill and influence to lead up. If your leader is not supporting you, you take responsibility to communicate better and make sure they have the information they need. In the case of overwhelming situations, leaders cannot be paralyzed by fear. Important to make a decision and move forward, using the best and immediate information they have available. Trying to find the 100% right solution leads to delay, and decay. – Discipline equals Freedom: One of the most important yet difficult aspects of leadership is to balance multiple lines. Leader has to be confident but not cocky, competitive but a gracious loser, attentive to details but not obsessed by them, strong but have endurance, a leader and a follower, aggressive not overbearing, quiet not silent, calm but not robotic, execute extreme ownership with decentralized command.